Yet again, I do not know weather my motivation for not getting rid of something is nostalgic or cheap? When in cleaning mode, it is about 50/50 for if I am in a toss it mindset, dreaming of a clutter free clean minimalistic look, or if I am in a cheap/nostalgic mood. In the later, I tell myself, "Oh, I could do something with this... it would be cheaper to save this than throw it out and have to PERHAPS buy something similar in the future." Or, "But this was my Mother's screen and wouldn't it be special to have it in the house in some fashion and be able to some day in the future tell my children how it was Grandma's from a LONG time ago? ;-) ) It is ridiculous the things I come up with to convince myself not to get rid of something (please, no one call Hoarders quite yet...I still can see 90% of my floor in all rooms...OK so maybe 70% in the craft room at the moment due to two beautiful oak dinning room chairs from Alex's grandma...that are broken and waiting for a project...). So the story behind this screen is that my Betty Crocker Momma has had this thing FOREVER! 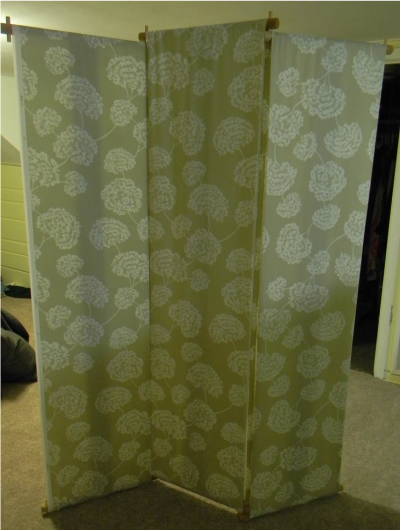 She covered it herself (judging by the fabric, in the seventies) and then it sat in our basement storage room from the eighties on. I can remember multiple cleaning sessions in which my mom was ready to part with the space hogging item but, I however, was not. I convinced her that I would love to have it someday when I had the space, so please keep it, pretty please?! Well, now that Hubby and I have the space all of these items are coming back to haunt me!! So many projects...so little time!! 1. Take off the previous fabric using needle nose pliers and a flat head screwdriver. 2. Use the previous fabric to cut panels of your new fabric. 3. Fold all of the edges of your new fabric under about an inch and press. This was instead of hemming. As long as you pull your fabric tight while you staple it back on, the folds should stay in place. 4. Wrap the fabric starting on the bottom of one side up over the top and finishing back on the bottom. Tuck edges Staple the fabric to the screen! See the old seventies fabric folded up so nice and neat in the corner of the picture above? Yup, you guessed it......I SAVED IT?!! Ug, I might need help....Hoarders on speed dial anyone? Side Note: This would not have been a cheap project if it weren't from my mom's awesome find at Unique Thrift Store. Occasionally you see bolts of fabric, which I am assuming are special order for someone and they either don't like it when it arrives, or more likely, never get to the project they had planned...I think this is a unique characteristic among most crafters. Well, my mom saw this roll of fabric (which when I measured it was 11 yards!!!) at Unique and called me to ask if I was interested, I was, so she.........shhhhh........ kind of "hid" it behind a display until I could go back and purchase it on a 25% off VIP day. (Yes, I am a VIP at the thrift store..sigh..). It worked!! I found her hiding spot, and other than being covered in dust bunnies, it was perfect!! Here is one of my summer projects that has been complete for a while, just haven't had time to share it! The other projects will come soon, I promise. I am realizing that though I have more "time" in the summer, I actually accomplish WAY more during the school year when I have more "structure" to my days! I shouldn't be too hard on myself, I did check off a few projects on my to-do list and I will be sure to post about them soon! 1. 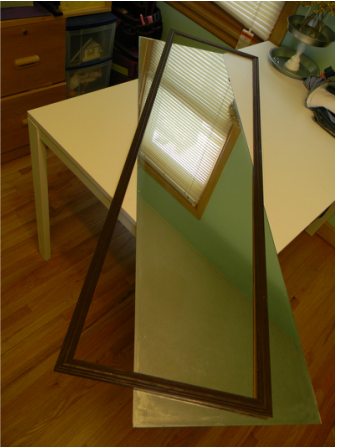 Remove cheap plastic frame from mirror. Mine was already falling off, so it was not difficult. 2. Cut your 1X4 boards at 45 degree angles using a miter box & saw. I actually started each cut with the box & hand saw but then completed each cut with my jigsaw (one of my favorite tools ever!). This just sped up the process. I have a pretty steady hand, but if you don't, I would stick with the box and saw for the whole cut. 4. Using a staple gun, staple the corner seams to help hold the frame together as it drys. 5. When the glue is dry, flip it over and stain! 6. The last step I do not have a picture of, sorry. When the stain is dry (next day), flip it over and run a thin line of liquid nails around the back of the frame on the edge closest to the inside. Then lay the mirror on top of the liquid nails and let dry. When I flipped it right side up I had some leakage from the liquid nails, however, it peeled right off the mirror when it was dry. Then you are done! 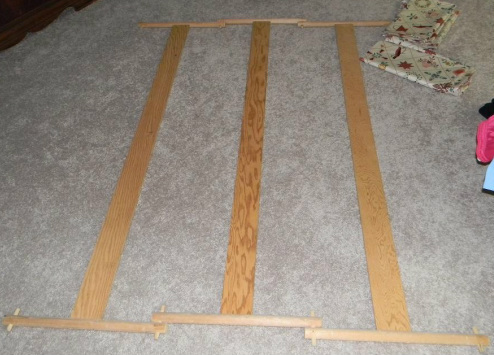 I can't wait to use this framing technique to make frames for pictures, or cork boards, chalkboards, etc! Any other ideas for this chunky wood frame? Sorry, couldn't resist!! Not quite as bad as the "Sew hard to give away sweatshirt" Hehe. So the reason this post is under "crafting" is not because it was becoming a lonely category jealous of "sewing"....but because this is practically a no-sew tutu. The only sewing is 1 line on the elastic band, which perhaps could be done by hand. Tulle: I was lucky enough to inherit a bunch of tulle from my great aunt, June. June was a wedding planner at her church for centuries and when we were cleaning out her attic for her, you wouldn't believe the AWESOME left over wedding decorations she had accumulated...;-) I had to turn away many fake rose centerpieces and plastic table cloths....but I did glady take the mountain of white and pink tulle! Elastic: I measure my waist and then subtracted 3 inches. Cut this length. Thread: To sew the elastic into a circle. I used a machine, but you might get away with strong hand sewing. 1. 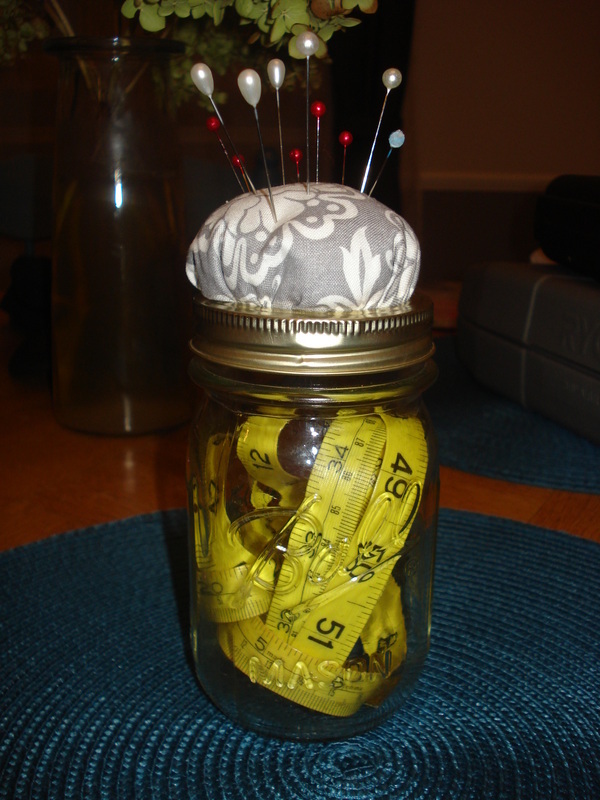 Take your elastic waistband and sew the 2 ends together to make a circle. 2. Cut your tulle into strips to the desired length of your skirt. Mine strips were about 4 inches wide by 36 inches long. 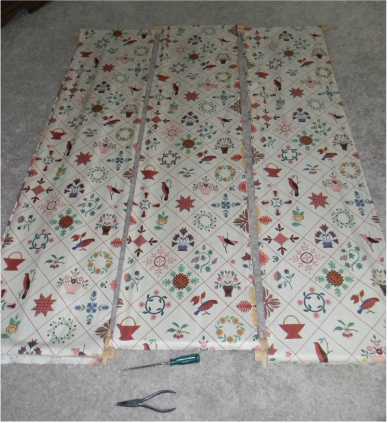 The picture shows that I cut on the fold so the length is only 18 inches (half). I cut about 10 strips at a time so that I wouldn't cut too many. Warning: if you finish your tutu when you are home alone on a Saturday night with a new techno playlist playing on your iPod....it miiiight lead to spontaneous silly dancing by yourself in you craft room. No, I am not speaking from experience. Being a teacher I love love love a great theme. 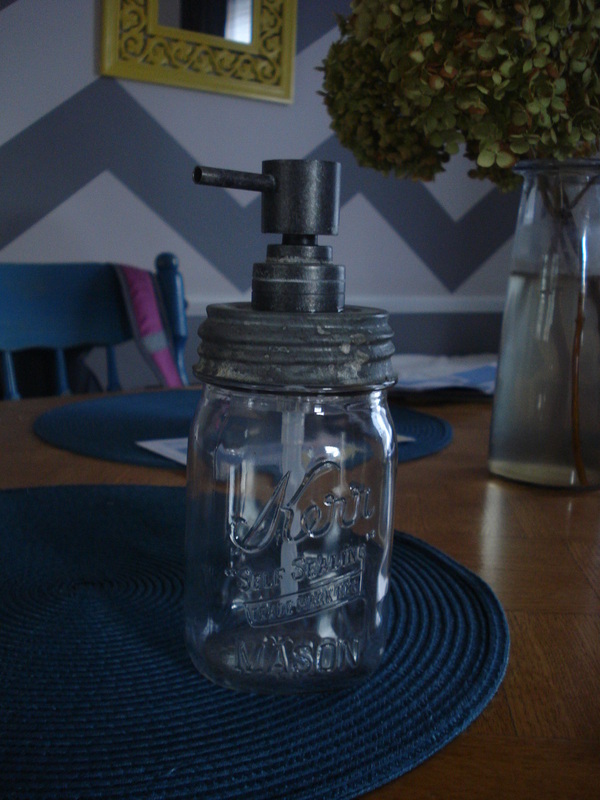 So it is no surprise that I adopted a theme for our august wedding.... mason jars! 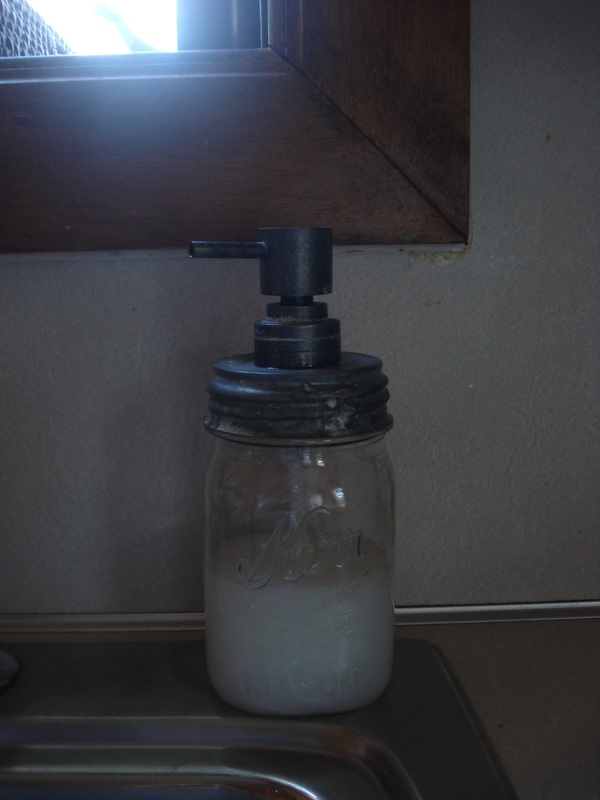 I adore the farm, casual feel of a mason jar, and the versatility of them as well. On our wedding day they were prominent from holding flowers and candles on the tables, to a hand drawn stamp on the invitation and save the date postcards. So now the question is what to do with 100+ jars that are warming a spot on the floor in the basement of our cozy little home? My initial plan was to sell them on Craigslist and make a profit or at least my money back. But now that the money has left my wallet it's like it was never there, right? So, I have decided to use them for as many projects as I can before we part ways. I have scoured the internet, pinterest particularly, and here are the first two of MANY mason jar projects to come!!! I have to give credit to an amazingly crafty 4th grade teacher at my school, I stole this idea from her. This ends up to be a VERY inexpensive gift (once you have the finishing spray and cork--which will go a loooong way) :) Leave it to teachers to always figure out the cheapest crafts!! 2. Mod Podge the napkin onto the tile, folding the edges and mod podging onto the back. I fold the corners like I'm wrapping a present. Putting a thick coat of Mod Podge over the top helps to give it a nice glossy finish. 5. Cut squares of cork the size of your tiles. Peel off backing paper and stick to the underside of the tile coaster. I wrapped the gift in a reused box using a Target paper bag. The blank canvas is too tempting and I had to draw on it. I also ripped up small circles and taped them on top of each other to make a flower. Here are some pics from my phone (that's why they are so dark--sorry!) of a couple of old projects. The cards were made for my mother and placed in a binder organized by months. I also addressed and stamped envelopes of her family/friends so her cards were all set to be sent! The ornament was made for a friend, her husband and newborn little boy. I used chipboard gingerbread men cutouts, painted them and hung from twisted wire.